Recently I went to Chartwell for a day to shadow Flick and Sophie, the 2 assistant house stewards there. Chartwell has a diverse history. it was originally a farmhouse that was builtin the 16th century, under the name of Well Street. Apparently, Henry VII stayed there during his courtship of Anne Boleyn, who was raised at nearby Hever Castle. During the 19th century, the farmhouse was significantly, enlarged and modified into the red brick Victorian building you see today complete with tile hung gables and oriel windows – bay windows on higher levels so they do not reach the ground. principal home. Chuchill hired an architect by the name of Phillip Tilden to modernize the house, especially with regards to bringing more light as oriel windows were notoriously poky and small. Tilden followed the thoughts of Edward Lutyens, who disregarded the fashionable Tudor revival style and instead made each house part of its landscape. The gardens were also refurbished at the same time and a series of lakes created to house Churchill’s precious fish. The gardens provided much inspiration for Churchill’s paintings, many of which he painted in his garden studio. 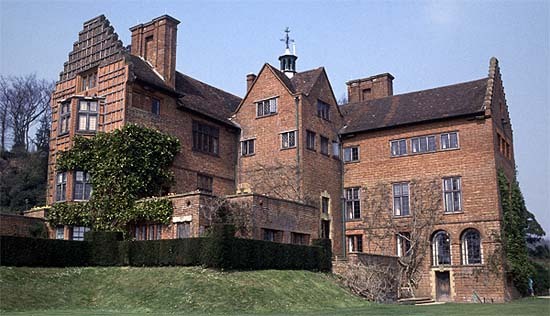 However, financial struggle struck in 1938 and Churchill put Chartwell up for sale. 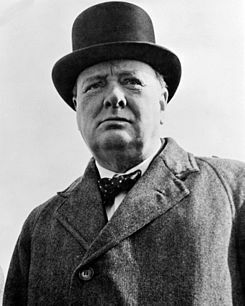 With the advent of World War 2 and with Churchill’s rising position in government, Chartwell was deemed unsafe for Churchill and his wife to live in due to its proximity to the English Channel and to the main road. Instead Churchill and his wife spent their weekdays in London and weekends in Oxfordshire and Buckinghamshire. After World War 2, with strained finances, Churchill put Chartwell back on the market. However, there was a light at the end of the tunnel. To thank Churchill for his efforts during the war, a group of business men got together and bought Chartwell. They charged him minimal rent on the condition that once both him and Clementine had passed on, Chartwell would be given to the National Trust. Upon Churchill’s death in 1965, Clementine decided to pass the house to the National Trust straight away. Clementine did, however, specify the route that the visitors would follow and still do today. One of the things that Churchill loved and this was untreated pine. to this end, as part of the modifications that Churchill made, large parts of the wood used was pine. 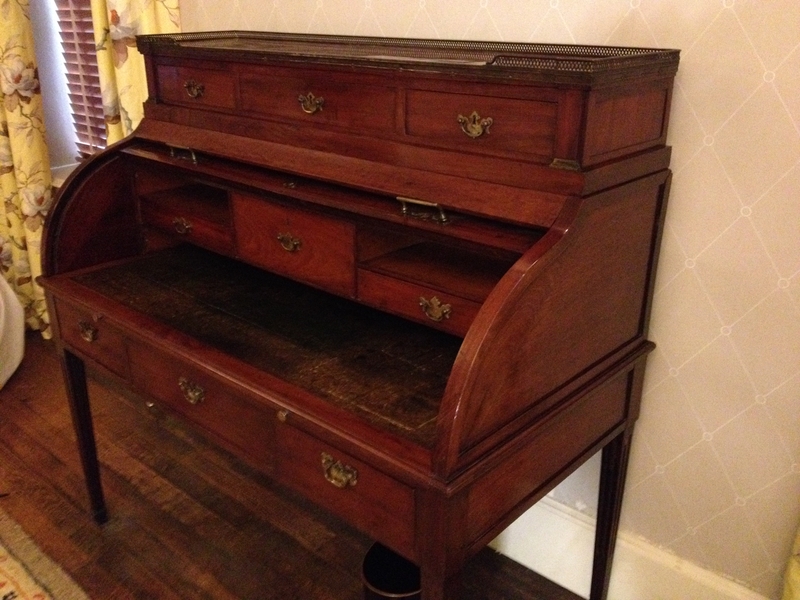 As it is untreated it has to be treated quite differently then polished or varnished wood. This was one of the things that I helped Sophie and Flick with. 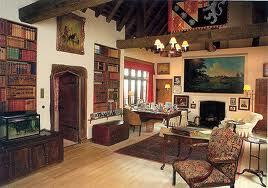 The oldest part of Chartwell is the study and Churchill’s bedroom, both of which date back to medieval times. To this end it is decorated with darkened pine. The stair case that leads down from the study to the dining room is a great example of natural pine. So that it doesn’t splinter or wear to quickly, twice a year a mixture of vinegar, sensitive soap and warm water are used to scrub the tread of the stairs as well as the top of the pine banister. After a short period of time clean warm water is scrubbed onto to reduce any stickiness. This mixture solidifies so that the stairs are non slippery as well as protected from the thousands of feet that climb up and down them over the year. The banister, once the mixture of vinegar, sensitive soap and warm water is applied is then waxed with Harrell’s wax, giving a little more grip for the visitors, staff and volunteers. 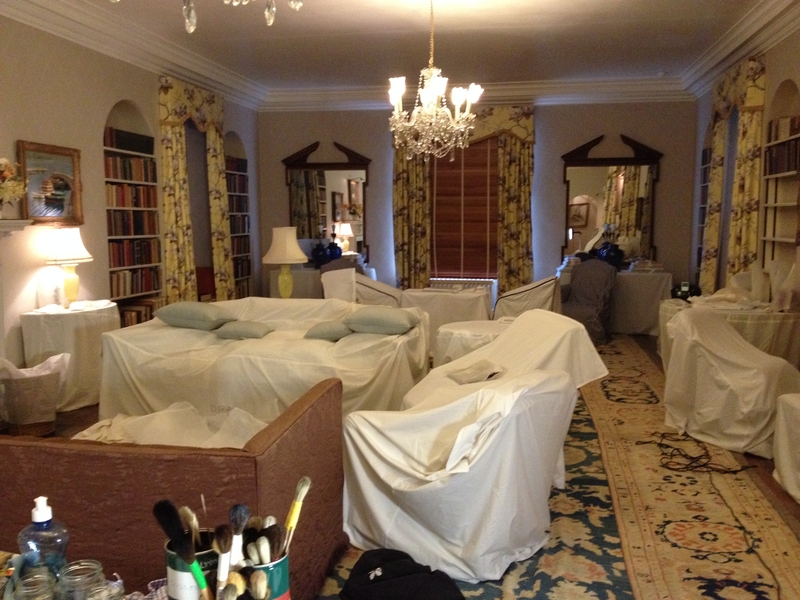 I also got to help them with the deep clean of Churchill’s bedroom, which is not normally on display. 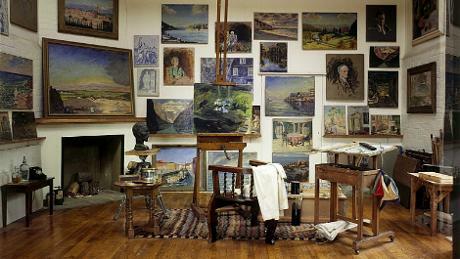 It is a small room, simply furnished as well as with photographs of his family and his favorite books. It also has an en suite bathroom with a sunken bath so that he could better enjoy the view. All in all, it was a really interesting day and I learnt quite a bit about Churchill and his lifestyle, as well as more about deep cleaning. 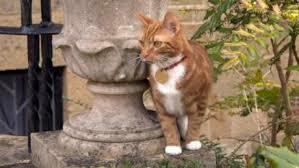 I also got to meet a couple of Chartwell’s cats including Jock – Churchill left quite specific instructions about there always being a Jock the Cat at Chartwell, including what he should look like! Categories: Uncategorized | Tags: Assistant House Steward, Cat, Chartwell, Churchill, cleaning, Clementine, collection, conservation, deep clean, House, House Team, Jock, Jock the cat, object, paintings, Showroom, Standen, Studio, training, World War 2 | Permalink. Earlier this week, I spent a day working at the NT-managed Chartwell; the family home of Sir Winston Churchill. Trust staff often spend a day or two helping out or job shadowing at other NT sites as part of their career development, and it was something that I was looking forward to doing. Every Trust property is unique, and so it’s always useful to see how different properties manage the challenges that their site presents. In the case of Chartwell, I was interested to find out how they balance their high visitor numbers (it’s one of the most visited sites in the South East) with their conservation responsibilities. Chartwell has two Assistant House Stewards – the position that my own role is roughly based on – and so I was also interested to find out what their jobs entailed. Chartwell is of a comparable size to Standen, and is similarly a much-loved family home nestled in a striking landscape. I was excited to get the chance to be nosy, and see behind closed doors at another property; especially one as famous as this! The property is set in a picturesque landscape, and on the morning I arrived, the surrounding hillside was hidden beneath a layer of frost and mist. Churchill had a great love of painting and drew inspiration from the landscape around Chartwell – and looking around, I could see why. I started the day by meeting the team, and having a tour of the house. Although the site is open 363 days a year, the house itself is open March to November and is currently under wraps and resting after a busy open season. 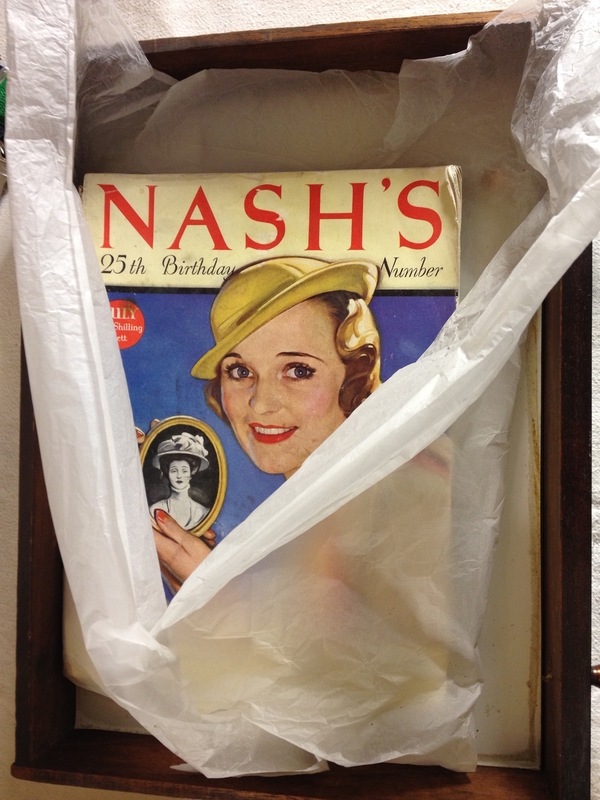 In November, at the end of the season, the house was ‘put to bed’: windows were shuttered, blinds were closed and objects were covered in dust sheets and acid-free tissue paper. When a house gets as many visitors as Chartwell, it’s really important that it has some respite, and that the house team are able to carry out their winter clean by inspecting and cleaning the collection. 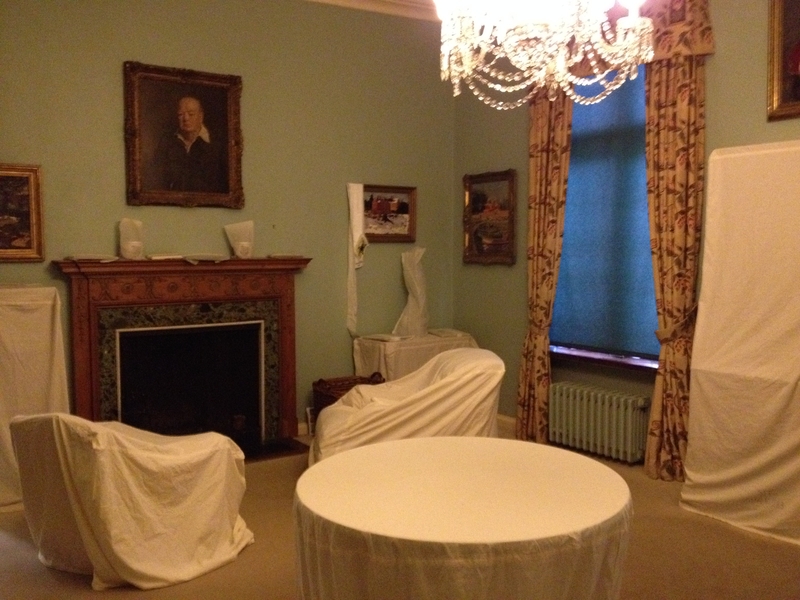 After the tour of the house, I began to help the team with the winter clean in the Drawing Room. 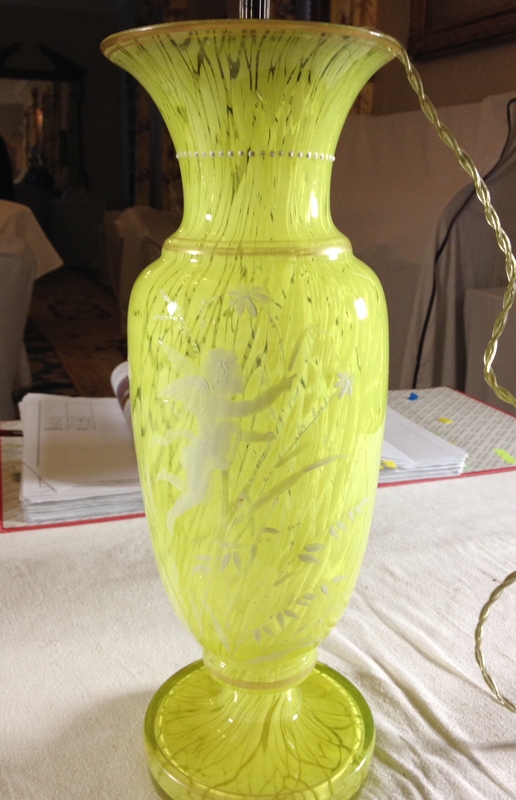 The contents of Chartwell are fascinating: although the house has many fine pieces, objects are particularly precious because of their connection to Churchill, and not necessarily because they are a fine example of a particular artist or designer. I set to work inspecting and cleaning the huge bureau, which held some interesting bits and pieces inside; including some headed Chartwell notepaper. In terms of balancing their high numbers of visitors with caring for an historic house, visitor flow through the house is managed by using timed tickets, so that visitor entry to the house is staggered. This helps with the logistics of moving lots of people around a relatively small space, and also eases the strain on the contents of the house. The way the visitor route is arranged through the rooms also helps conserve Chartwell’s collection – for instance, some of the rooms are roped off at a specific point, from which visitors view the room; therefore helping to protect it from physical wear and tear. At Standen, we have replaced some objects – carpets, for instance – with ‘sacrificial’ items that are historically appropriate but can be used or walked upon, enabling visitors to move around rooms. However, visitors to a place such as Chartwell expect to see objects and furnishings belonging to Churchill, so roping certain rooms off at points in order to conserve the contents is a good way of striking a balance. I enjoyed helping the Chartwell team with their winter clean, and it was a real privilege to be able to clean objects connected to such a well-known and respected figure. It was also a good chance to observe how different historic houses have different approaches to managing conservation concerns and visitor access. Categories: Uncategorized | Tags: Carpet, Chartwell, cleaning, collection, conservation, deep clean, Hannah, House Team, National Trust, object, Standen, visitors, winter clean | Permalink.